11.01.2018 - New York, NY (November 1, 2018) – John Mellencamp announced today additional dates to the 2019 tour of “The John Mellencamp Show” which will feature the rock icon’s classics plus some new material. Being hailed by critics and fans alike as one of music’s most authentic and crowd pleasing concert performers, Mellencamp has added an additional 13 dates to his 2019 tour. The news follows his previously announced dates, which will kick off with a sold out show in his home state of Indiana on February 7, 2019 and continue through April 30, 2019 in Albuquerque, NM. 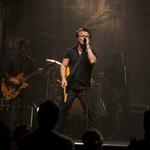 Produced by AEG Presents, “The John Mellencamp Show” will start promptly at 8pm and will not have an opening act. Every ticket purchased online will receive a physical copy of Mellencamp’s forthcoming album “Other People’s Stuff” set for release this December by Republic Records. Tickets for the tour will be available to the general public beginning Friday, November 9th at 10:00am local time (except 11am in Green Bay). Mellencamp.com and VIP pre-sale tickets will be available beginning Wednesday, November 7th at 10:00am local time until Thursday, November 8th at 10:00pm local time. American Express® presale begins Wednesday, November 7th at 12:00pm local time until Thursday, November 8th at 10:00pm local time. Numerous dates have already sold out with more to come, for more information and all ticketing information please visit Mellencamp.com. All tickets are on sale November 9th at 10am local time unless noted otherwise below. John continues to focus on another facet of his artistic expression: painting. His style has progressed over the years as evidenced by several gallery shows and published portfolios, and in recent years he has increased his output by completing over 100 new works. He had his second solo exhibition this past Spring in New York and has a current exhibit at the famed Butler Museum in Youngstown, Ohio from September 20th through January 19, 2019. His highly successful Rock and Roll Hall of Fame exhibit ran for nearly two years and is now at the Woodie Guthrie Museum in Tulsa, Oklahoma from September 1st through November 18, 2019. I have mistakenly deleted my email. Can you give me the presale code for the Albq April 30 show? Posted by Dtcowboyfan 2018-11-08 19:37:40.